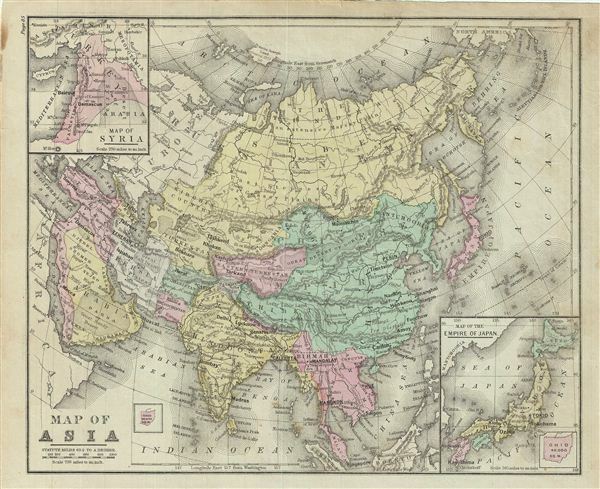 As this map was drawn, Imperial China wilted under the weak Qing Dynasty while the Russian empire attained the height of its pan-continental expansion. Turkey and the Middle east were under Ottoman rule while the British Raj governed of India. Throughout, the map identifies various railroads, cities, towns, rivers, islands, mountain passes and an assortment of additional topographical details. The map is color coded according to regional and political boundaries with elevation rendered by hachure. Issued as page 85 in the 1879 edition of Warren's Common-School Geography.